Following successful tours in 2012 and 2013, Ewan Wardrop’s smash hit Formby returns for a 25 venue national tour this year. This is Salida Theatre company’s biggest tour to date. Ewan Wardrop as George Formby. Formby is written by Ewan Wardrop and co-devised and directed by Co-Artistic Director of Salida Productions Ed Hughes. It is not only a celebration of one of Britain’s greatest performers, but a funny, touching and thoughtful look at the life of an essentially ordinary man with an extraordinary talent. Ewan Wardrop is an actor, dancer and musical comedian, appearing regularly on the comedy circuit as well as on stage and on screen. He initially trained as a dancer and was a principal performer with Matthew Bourne’s company Adventures in Motion Pictures. He played leading roles in Swan Lake, Nutcracker! and The CarMan. For Play Without Words, Ewan was part of the original cast, for which Bourne won an Olivier Award for Best Choreography in 2003. As an actor recent credits include Enron in the West End, Headlong Theatre’s award winning play directed by Rupert Goold, Terence Rattigan’s The Deep Blue Sea and Rattigan’s Nijinsky at the Chichester Festival Theatre directed by Philip Franks and in the films Mr.Happy directed by Eugene Magee and Waiting For Sunrise directed by by Gary Morecambe. He has also worked with companies including Complicite, the Royal Shakespeare Company and award winning comedy acapella group Barbershopera. 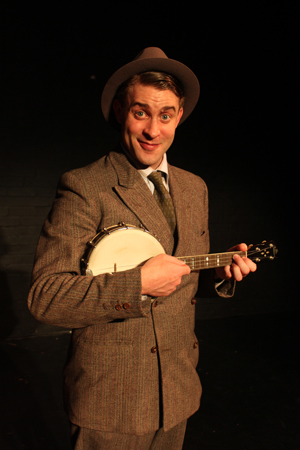 For the Edinburgh Fringe 2012, Ewan wrote and starred in a one man play entitled Formby about the life of the comedian and ukulele player George Formby. While at the festival, Ewan was invited to play on several other shows including Nicholas Parsons’ Happy Hour and Comedian and 8 out of 10 Cat’s Team Captain Jon Richardson’s sell-out show at Assembly Hall. Ed Hughes is the Co-Artistic Director of Salida Productions. His previous director credits include Romeo and Juliet with Astillero Tango Orchestra and The Farmer and the Shepherd (film) and the part of Mayakovsky in Andrew Rattenbury’s Mayakovsky: The Slanting Rain. As an actor, his credits include Fear and Loathing in Las Vegas (Waterloo Vaults), This House (National Theatre) Democracy (as part of the Michael Frayn Season at Sheffield Theatres), Lakeboat and Prairie du Chien (Arcola), Enron (Headlong and Noel Coward Theatre), Everything Must Go (Soho Theatre), The Lifesavers (Theatre 503 and Mercury Theatre, Colchester), Rough Crossings (Headlong), The Canterbury Tales (RSC, West End and world tour), Hamlet (Old Vic), Romeo and Juliet (ETT), Finding the Sun (RNT), The Little Foxes (Donmar) and ‘Tis Pity She’s a Whore (Young Vic). For television, his work includes David Copperfield and Wallander, and for film, Bulletproof Plan, Anesthesia and Incendiary. Salida Productions are Ed Hughes, Michael Vale and Andrea Pelaez with Sir Kenneth Branagh as their patron. Formed in 2009, their first production was Romeo and Juliet with Astillero Tango Orchestra a co-production between Salida and the Mercury Theatre Colchester. The production was awarded an Unesco High Achievement Award. In 2011 they together with Dreamepic premièred Gutter Junky by David Kantounas at the Edinburgh Festival, and partnered with the Mercury Theatre for a second time on Mayakovsky: The Slanting Rain by Andrew Rattenbury which played at the Royal Shakespeare Company in 2013 as part of the A World Elsewhere Season. Their first film The Farmer and the Shepherd is currently in post-production. They are the recipients of a Stage One Bursary, and also have received one year of business support and development via Guildhall’s newly developed Creative Entrepreneurs scheme.